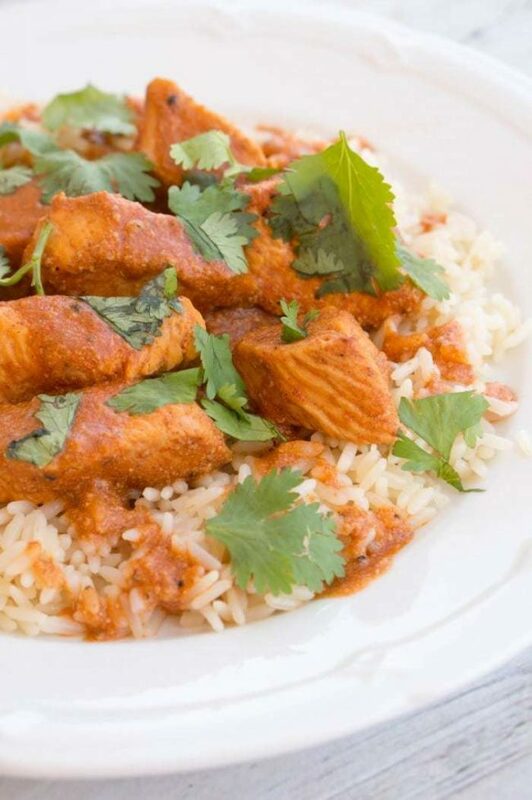 Today marks National Cook With Your Kids Day, and there’s no better way to get the kids in the kitchen cooking with you then with our Chicken Tikka Masala recipe. 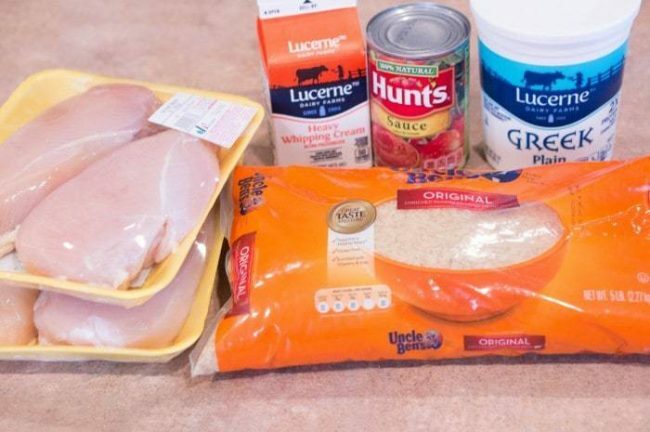 We’ve partnered with Uncle Ben’s for this post, and can’t wait to show you this amazing recipe. 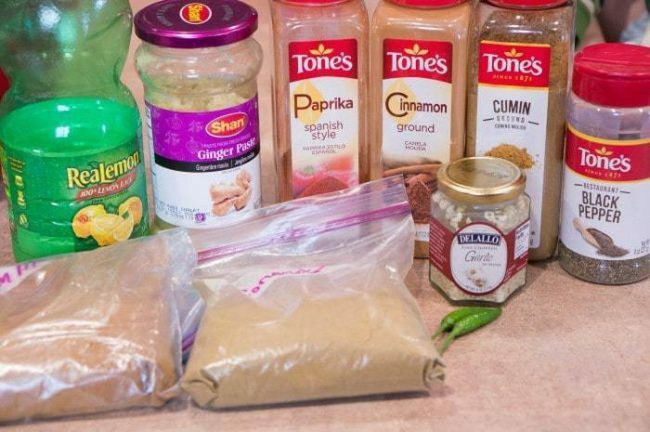 It’s an ethnic Indian dish that will feel like an expensive restaurant dish, but it’s so easy to make and almost every step the kids can help with! What’s great about starting with a dish they’ve never tried, is that when they’re helping to prepare the meal the kids are more willing to try something new and experience new flavors they haven’t tried before. 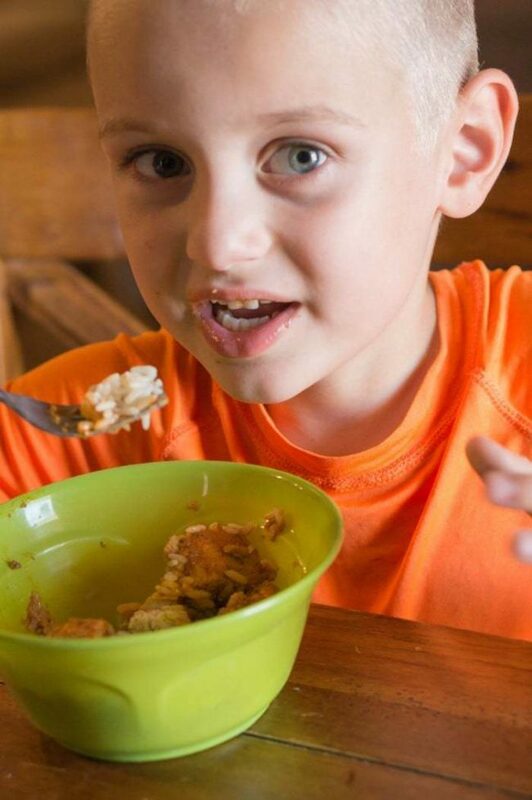 By getting them involved in the cooking process, the kids will be more likely to dive in to enjoy the dish! 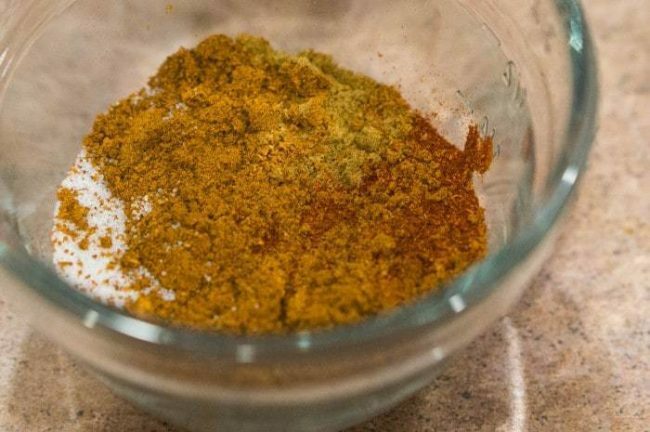 The ingredients list looks overwhelming, but it’s really just a handful of spices and then a few additional ingredients you add to that. It’s really much easier than it will look. Let’s get started! Create your chicken coating by combining greek yogurt, lemon juice, and spices. Mix together in a bowl until combined. Then, add your diced chicken and stir to combine. Allow your chicken to marinate in the coating for an hour in the fridge. You can skip the marinating time if you’re short on time, but it will be more flavorful if you allow it to sit. 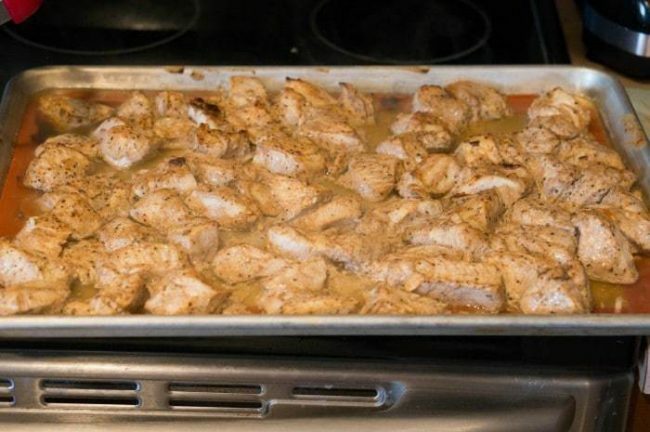 Next, spoon your chicken mixture onto a baking sheet. You want it to be just one layer thick, without chicken stacked on top of each other so it will bake properly. Broil the chicken at 500° F for approximately 15-20 minutes. You’ll want to pull out the chicken as soon as it’s golden brown. Once your chicken is in the oven, it’s time to start some rice. Prepare 2-3 cups of dry rice. 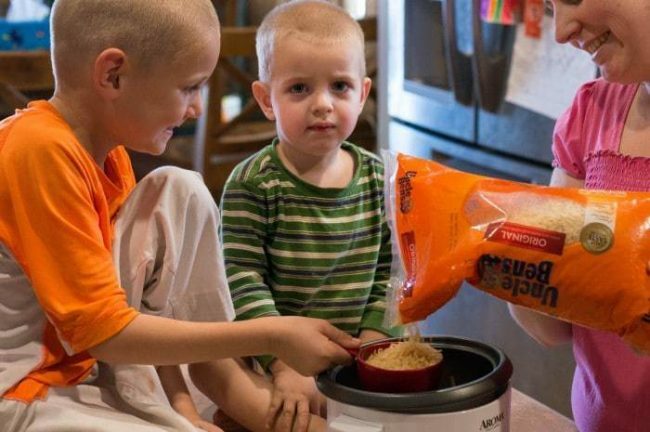 The kids love helping with the measuring the rice and adding water and butter and then watching as the rice cooker does it’s magic. 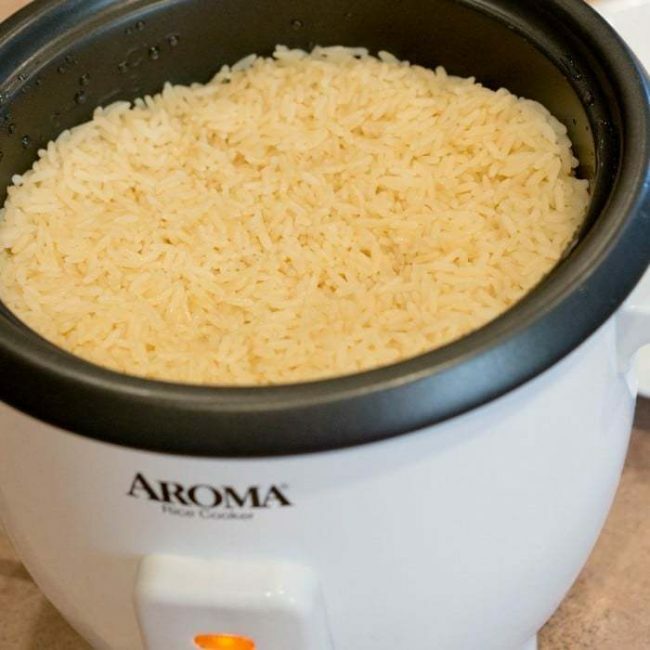 You can also cook Uncle Ben’s rice very easily on the stove, but we love our rice cooker as it makes it easy for the kids to help and we can set it and forget it. Now, you’ll create the sauce. Start by combining all of the spices into a small jar. Next, add finely minced Thai peppers. You’ll use 1-2 peppers, depending on how spicy you prefer your food. Adding 1 Thai pepper won’t make your dish overly spicy, but adds a lot of flavor. If you can’t find Thai peppers locally, you can substitute in a jalapeno pepper. Melt butter over a medium heat. Add spices and garlic and continue to stir. Next, add tomato sauce and heavy whipping cream. Allow the sauce to simmer on a low heat until the chicken is ready. When the chicken is done cooking, add it to your sauce and allow to simmer for 30-40 minutes. The longer you allow the meat to cook in the sauce, the more tender your meat will be. You can serve the dish in as little as 15 minutes if you’re short on time. Serve up the dish by starting with a good helping of Uncle Ben’s rice. It should be perfectly cooked and ready and warm waiting until you are ready to serve the meal. Top the rice with chicken and as much of the sauce as you’d like. I like to drizzle a bit of the sauce over my rice. 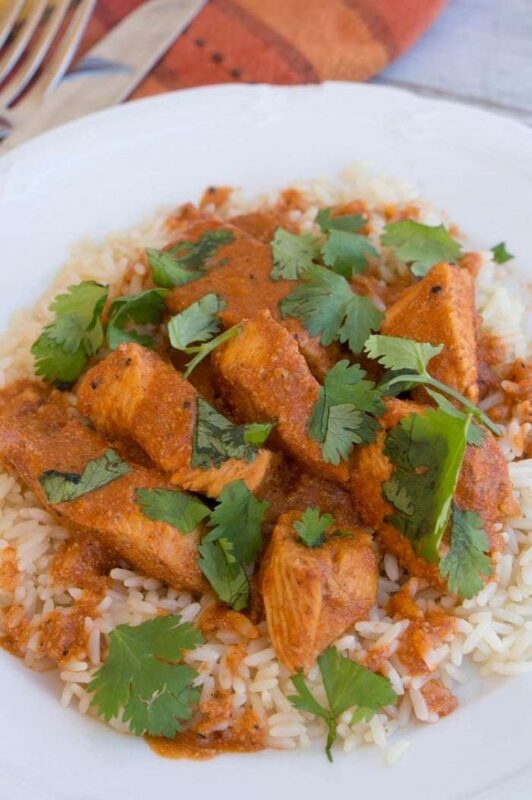 You can also top your Chicken Tikka Masala with a pinch of cilantro, if you’d like, as a garnish. Now, it’s time to eat and enjoy!! This recipe is my 6 year old’s favorite recipe! He’s always asking to cook it. My husband cannot get enough of this recipe, he adds it to our meal plan about once a week (or more often if he can). This is a recipe that will not disappoint. Every child has the capacity to cook, as long as they have a parent to guide them through the process and the tools they need to learn the skills and steps necessary. Uncle Ben’s has a whole digital hub dedicated to help parents teach their children to cook with an interactive site that makes it easy. If you need help or inspiration of what to cook together, turn to beginners.unclebens.com. You will find recipes, tips, and tricks to make the most out of your cooking experience. The recipes follow an easy step-by-step format that anyone can follow. As you work through the website, you can earn fun badges for completing lessons as you learn about skills such as stirring, chopping, measuring and more. 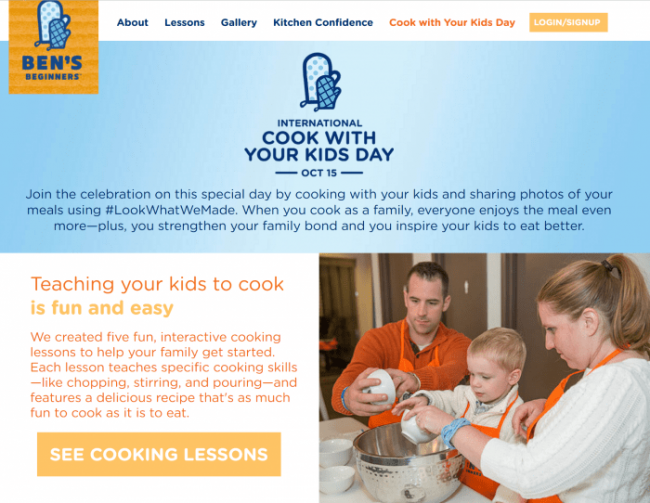 This year marks the inaugural year of the International Cook with Your Kid Day. 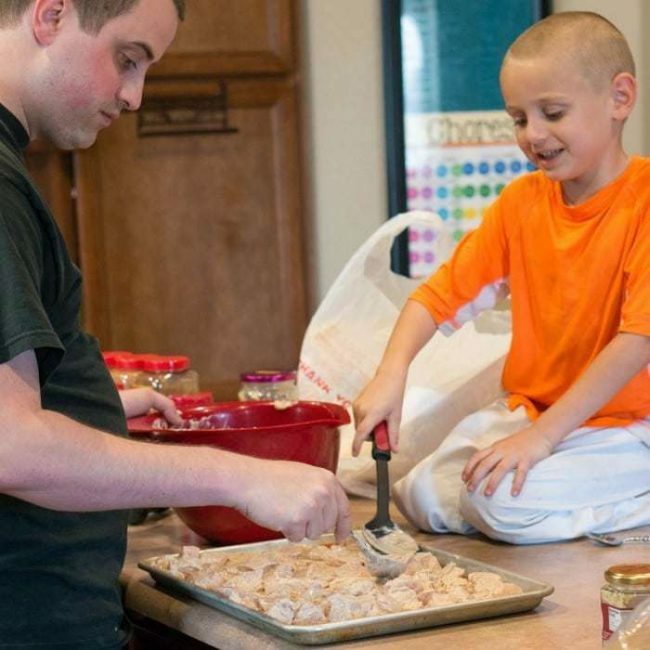 To celebrate this special occasion, Uncle Ben’s is helping to raise awareness around all the variety of benefits to families that cooking together can bring. They want to hear how cooking together has impacted your family and what you’ll cook together today. Parents around the world can join in by sharing their photos, videos, and/or stories of their cooking adventures with the hashtag #LookWhatWeMade. You can also join in the annual UNCLE BEN’s Ben’s Beginners Cooking Contest with the official hashtag #BensBeginners. The contest ends tomorrow, October 16th, so hurry over to enter! 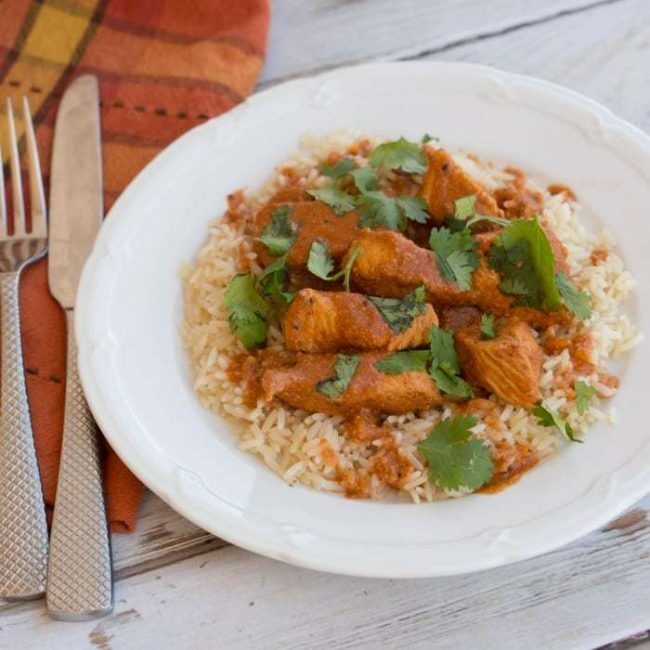 This flavorful, ethnic Indian dish will become a favorite. You can shorten marinating time and simmer time, in a pinch, but the dish will be more flavorful and tender the more time you allow. Combining greek yogurt, lemon juice, and spices in a bowl. Mix until combined. Add diced chicken and stir to combine. 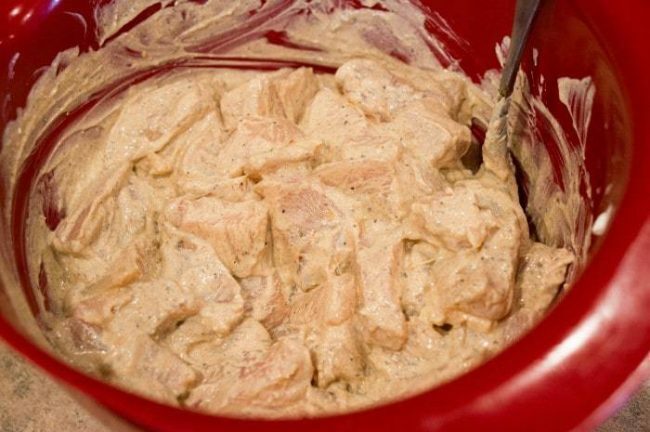 Allow chicken to marinate for an hour in the fridge. Spoon chicken mixture onto a baking sheet, evenly spread. Broil the chicken at 500° F for 15-20 minutes, until golden brown. While the chicken cooks, prepare 2-3 cups of rice. Begin the sauce by melting butter in a large pot over a medium heat. Add spices and garlic and stir. Add tomato sauce and heavy whipping cream. Allow sauce to simmer on a low heat until the chicken is ready. Add finished chicken to the sauce and simmer for 30-40 minutes. Serve the chicken on top a bed of rice. No matter what recipe you decide to cook, take the opportunity to get into the kitchen as a family. There are so many great reasons to let the littles help, we’re sharing our favorite 10 reasons reasons to cook with your kids! Loved this recipe? Share it on social media! This sounds so delicious!! Adding it to my recipe book. Thanks for linking up with Merry Monday! Adding this to our dinner list! It looks delicious! I never even considered making a recipe like this at home- but armed with your instructions I think I might just take the plunge! This looks SOOO GOOD! My husband saw me pinning this and he got very excited, he thought I was making it for him LMAO! So I guess I will be soon! This looks so delicious! I love it when my kids are helping me in the kitchen! Our kids love working along side us when we cook or bake. Teaches them great life skills and lets you bond as a family at the same time. What a wonderful looking meal! I need to try this out. This looks great. It’s different from something we’d normally make. I would love to give this a try for dinner soon. The crushed red pepper in there makes me one happy girl. Can’t wait to make this at home! This recipe looks really yummy. I am always looking for new chicken recipes and if the kids can help me cook, then that is a plus! Chicken and rice dishes are my families favorite. I definitely want to try the Tikka Misala. I totally love cooking with my kids, but had no idea there was a day for it. It looks soooo good! I’ve had in an Indian restaurant! Yummy! I love chicken based recipes and bet this is really tasty. I need to pick up some rice and cumin so I can recreate this dish. This does look good. Learning to cook is important for kids. My daughter enjoys cooking with me. I can’t wait to make this! I was still trying to figure out what I wanted to make this week with my chicken. Thank you for sharing this. My daughter has helping out in the kitchen recently and she likes using Uncle Ben’s. We will have to try out this recipe. This looks like such a delicious and easy meal. I am sure my family would love this. I love to cook with chicken. 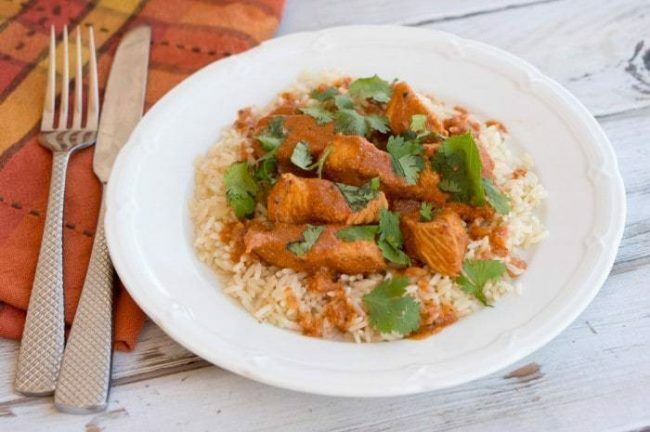 This Chicken Tikka Misala recipe looks so yummy. I am excited to make some. This looks so delicious I wan to make some for dinner tonight. My kids love to help me in the kitchen. I think it is an essential skill to learn. I think it is so important to cook with your kids. This recipe look delicious and fun to make. My kids are going to love it. That food was so good! I enjoyed it, even though it was made by children. My kids enjoy Tikka Masala but we have never made it at home before. This looks really good. It is fun to cook as a family. My fiance loves this dish but always buys the jarred sauce. thanks so much for the recipe! That looks yummy! I will cook this over the weekend. This looks quite good! I always like cooking with kids. It is so great on so many levels. You spend time together, and they learn. They learn not only how to cook a meal, but there is math, and time and so many other things. Kids also love it when they have cooked and everyone loves it! This looks so good. I am going to try it out on my bunch. I want to make this recipe with the kids! They would love it and I need to find different recipes that me and the kids can make! 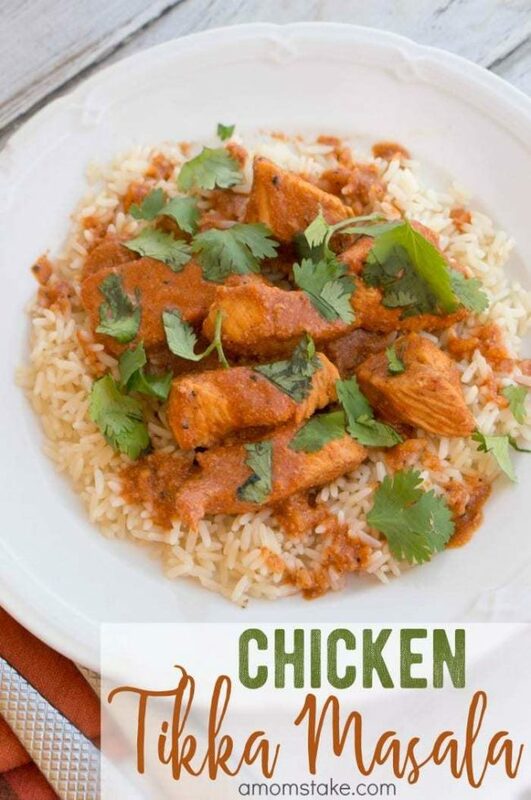 I have never tried Tikka Misala chicken before but this looks really good! I will have to try making this with the family. I’ve not yet had Chicken Tikka Misala nor made it! Pretty complicated for little ones, but sure it worth it! Most kids’ palettes aren’t that sophisticated yet – you may have chefs in the making there! It looks scrumptious! Oh that looks so good and easy to make! I love ordering it when we go out to eat, but have never tried making it at home. I will have to give it a try!